They are kinds of hamon pattern, but they don't mean only a matter of pattern. They show us very interesting effect of hardening work on sensitive steel. It is an appearance that the hamon starts at a distance from ha-machi. It appears by the hardening work that has lack of temperature on the tang. The Yakiotoshi that we appreciate is a matter of hardening effect, never a matter of hamon designing by clay. 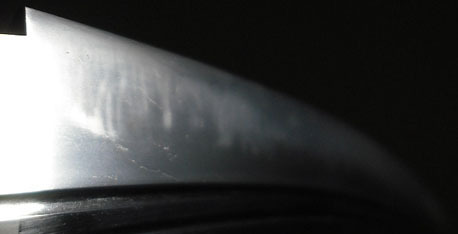 The starting of hamoon in this style shows the phases of hardening effect clearly on the blade. So we can study the hardened area, hamon line, ji between hamon and mizukage, the steel below the mizukage. We can study how the steel changes by the heat treatment to harden it. On the blade with yakiotoshi hamon, the part near the tang can't have a sharp cutting edge. But it is not a trouble for sword fight. So it is not a failure of blade. On the blades before 12th century, Yakiotoshi appears commonly. So it may be an ancient style of hardening. In 12th century and 13th century, sometimes it appears on some blade naturally. On the other hand, there are several schools those are famous with yakiotoshi hamon. For example, Yukihira in Bungo province, Naminohira school in Satsuma, and some schools in Kyushu island. Sometimes yakiotoshi can be found on re-hardened blade. In some case of re-hardening work on a blade that has appreciable tang, smith doesn't heat tang much, to keep its condition. On such work, yakiotoshi appears sometimes. Yakiotoshi is not a proof of re-hardening. It is just a matter of hardening work. It is a fantastic effect of sensitive steel on hardening work. The appearance is that the start of hamon rises wide following the utsuri, the hamon particles are thin there, then the hamon becomes lower with dense particles. The less of hardening effect at the starting of hamon makes it wide naturally, but with thin particles. It can be seen only on good blades in 12th century or 13th century. It is unexpcted appearance for the smith, but not failure for blade. It shows us a wonder of sensitive steel on hardening. We appreciate it very much, but rare to find. For example, Ko-bizen, Ichimonji, Awataguchi Kunitsuna. The koshiba is never found on later smiths' work. They made well ordered hamon from the ha-machi to the kissaki. An example of koshiba, but not very clear. Some smiths in 15th century copied the koshiba pattern by clay designing. Such hamon also is called koshiba, but only a meaning of a kind of hamon patterns. For example, Muramasa, Kanesada in Seki.